The issue of how people learn is often debated, usually by training providers who want to show that their way is best so that they can continue to make money out of it. Also, Universities need research projects to fund new buildings and foreign trips, so what better subject to research than how people learn? Kolb's theory of learning has been around for almost 30 years, and is, in my mind, analogous to Newton's laws of motion. Newton didn't invent the laws in a cave and then impose them on the universe, he merely thought about what he observed and found a way to encode patterns so that they could be shared with others. A few hundred years after he did that, NASA were able to throw a tin can out into space and make contact with the moon, all using Newton's calculations. Kolb didn't invent learning, and his theory doesn't dictate how people should learn. Unfortunately, Honey and Mumford hijacked the learning cycle and created 'styles' which many people take to be static preferences, which they're not. People exclaim, "I can't take an exam, I'm an activist", or, "I can't take part in that exercise, I'm a reflector". Nonsense. They're just lazy. I cannot see any reason to doubt the observation that in order to learn something new, I have to experience something that is outside of myself. Everything else is just a synthesis of what I already know and have experienced. And on order to be able to reproduce a behaviour, I must make a connection between input (sensory) and output (motor) and the only possible way to make that connection is by doing something and testing the result for myself. See 'The Brain that Changes Itself' by Norman Doidge for lots of examples and research that shows how this works. Most importantly, this research is right up to date, not 30 years old like NLP's or Gardner's. 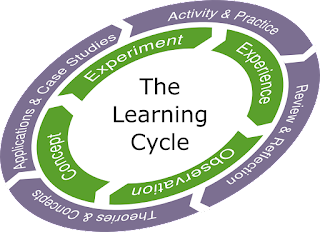 So I feel it's misleading to think of learning styles as a model or theory which can become outdated; instead think of it as a simple observation that we must observe and do in order to create an internal model that reproduces a learned behaviour. There is absolutely no other way to learn. And don't cite the example of teaching someone how to perform a task just by describing it to them; that is the process of assembling already learned behaviours into a new sequence. I believe that the reduction of Kolb's learning cycle into Honey & Mumford's learning styles is the cause of the problem. "I'm an activist because I need to do something" doesn't make sense. We all have to do in order to learn. And as an 'activist', you have to reflect on your experience, form a theory and test that theory in order to learn, otherwise you'll keep on doing the same thing, over and over again. Just watch Jeremy Kyle's TV show to see what happens when people don't reflect on their mistakes. Are these theories mutually exclusive? I suggest that they cannot be. Whatever the method by which we learn, there is no doubt that something starts in the outside, physical world, and is transferred to the inside, mental world as a model. There can be no doubt that these words are not written inside your skull, yet you have learned their meaning, therefore the pattern of neural connections in your brain somehow represents the knowledge which you have gleaned throughout your lifetime, and that generalised representation is a model. The truth is that we have absolutely no real idea how that happens. Are some people better at learning from images than others? Are some people better at learning physical movements than others? Do adults have a natural desire to learn which must only be facilitated? We may never know, because we've lost the instruction manual and, as far as we know, God doesn't offer extended warranties. However, piecing together what we know by experiment and what we might deduce to fill in the gaps, I suggest that there can be no doubt that learning must have an element of real, sensory experience. Something must happen on the outside which excites our sensory receptors. We must then make sense of that new experience using our existing frames of reference, because what else do we have to rely on? We know that the brain requires a period of rest in order for new neural connections to form, and we know that knowledge must exit in order to apply it. I have to have some idea of what to do before I start pushing all the buttons on my new mobile phone or video recorder. And I propose to you that this sequence of events is neatly described by Kolb's experiential learning theory, and the other learning theories listed on the previous page nest neatly within it. How do you like your concrete experience? Visually? Logically? Physically? Musically? Medium rare? Whichever of these is your favourite learning theory, I encourage you to always make your instructional design as complete and multi-faceted as your learners are.